The guy behind the Break The Rules compilations(one of the best in the series of all “KBD” boots) decided to go for the a-side Betonikolossit on volume 9. I think the b-side Hipinreuhake is way better. 500 pressed of this their first release out of three. One of my favourite finnish band. Their “heikot sortuu elontiellä 7” is also great! They have 4 lp`s. The last two published in the 90`s when they did a comeback. Theyre first lp Namuja Lapsille just got CD version. Great album. Hello again! 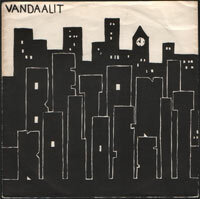 Vandaalit is re-formed again and theyre gonna make couple gigs in Finland. Jusr wanted you to know. To my surprise You only posted the B side. It’s a great tune but I Frankly disagree with You. The B side is speedier and punkier but I kind of prefer face A. Please post it for everyone to judge.